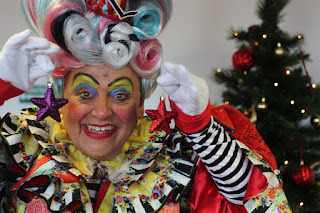 Visitors to The Customs House are being asked to help give the gift of panto this Christmas. The South Shields theatre has launched Wishing on a Star - a fundraising campaign to help more children and young people and their families attend a performance of next year’s panto, Beauty and the Beast. campaign at The Customs House. Star-shaped baubles are available to buy for £1 each at the box office. People can then add their wishes to them and hang them in The Green Room café, bar and bistro for the duration of this year’s panto, The Lambton Worm, which runs until Saturday, January 6. As well as providing a blanket of stars for decoration, the sale of the baubles will be used to subsidise tickets for next year’s show for people who would otherwise not get the opportunity to attend a panto performance. The Lambton Worm panto has been written in celebration of the 150th anniversary of the famous north east folk song, which tells the tale of John Lambton’s battle against a ferocious beast that had been terrorising County Durham villages. You can read the North East Theatre Guide review HERE. The cast also includes David John Hopper as Arbuthnot, Steven Lee Hamilton as The Brave and Bold Sir John Lambton, Georgia Nicholson as Poison Pen from Penshaw, Natasha Haws as Susie the Soothsayer, Eleanor Chaganis as The Princess, Gareth Hunter as The Sultan, Cal Halbert as Lord Larry Lambton and Lewis Jobson as Puddles the Dog. Tickets for The Lambton Worm are priced from £9.99. Performance times vary. Contact the box office on (0191) 454 1234 or book online at www.customshouse.co.uk.